In Office 365 there are now many similar options available for collaboration. 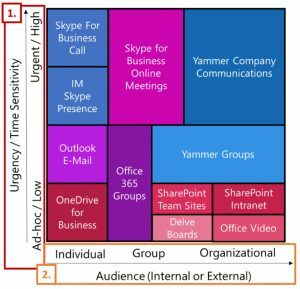 You now have the traditional Distribution Lists (aka Distribution Groups), Office 365 Groups, Yammer and more recently Teams, and of course there is also SharePoint, OneDrive and Skype for Business. So with all this choice… how do you choose? Office 365 groups tie a number of Office 365 features together including OneNote, SharePoint/OneDrive, Planner, Calendar and Site Mailboxes. These were Microsoft’s first attempt at trying to create something more holistic instead of the traditional silos. O365 Groups can work well for up to 1000 members, after that performance of conversations can get affected. By default any user can create an O365 group up to a maximum of 250 groups per user. Yammer is also sometimes referred to as a Facebook for Business. Personally I’m not a massive fan of Yammer as it is yet something else to monitor, however if it is implemented well and full adopted then it can be useful. Microsoft have started to use the term “Work Out Loud”, so by that I think they mean instead of researching things yourself all the time just say what you are working on or exploring, and then see who else knows about that and perhaps already has a solution. SharePoint has been part of Office 365 since day 1 and as well as the more commonly used file store replacement, it is great at workflow, forms and other more advanced implementations. It works well both inside the organization and outside and more recently allows co-authoring of documents for Office file types. OneDrive is a home drive replacement, although I think Microsoft needs to rethink the sync client so that it is more of a most recently/most desirable cache instead of an all document sync or user managed selective sync. It is built on SharePoint and fundamentally has similar features to a SharePoint site collection used for file storage. Skype for Business is an Instant Messaging, online meeting system where you can have virtual meetings both within the organization or including members outside of your organization. It is similar to the consumer version of Skype, albeit without persistent chat. Microsoft’s latest attempt at bringing together the various Office 365 technologies including OneNote, SharePoint/OneDrive, Calendar, and persistent chat. It is still only in public preview, however you can see that this is bound to replace Office 365 groups altogether in the future. In fact I’m wondering if the Teams client will eventually replace all of the Microsoft clients and roll them into a unified interface. A good picture that describes the choices is shown below. It was created before Teams was announced and presented at Ignite. 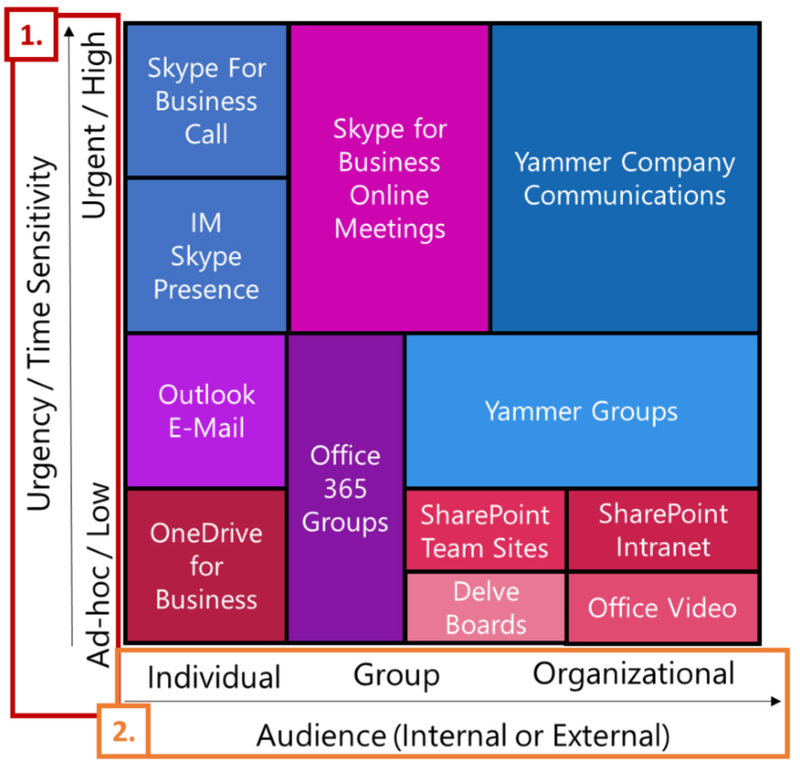 To me Teams and Office 365 groups largely fill the same space, perhaps Teams ultimately taking over a portion of the Skype for Business Online Meetings area. So as you can see based on the urgency of communication and the audience you can work out which is a good tool to explore. The big thing to take from the above is that you don’t just choose a single product. You use whichever product is appropriate/desired for the problem you are trying to solve. I’d add Distribution Lists to the above and use them for large internal/external memberships, especially for announcements that you don’t just want to post on Yammer or the Intranet. There is a great whitepaper from 2toLead which goes into a lot more details of the various options and scenarios. So wrapping up, there is no real easy answer to what tool do I use when. We’d love to hear how you choose which tool to use and are happy to discuss your requirements and see which tool(s) may fit the bill.